Call me TODAY for a free consultation! 39 1/2″ X 54″ Framed Pastel Painting. The Honorable Sidney M. Aronovitz was a United States District Judge for the Southern District of Florida for over 20 years and was born in Key West, Florida, on June 20, 1920 passed on January 8, 1997. 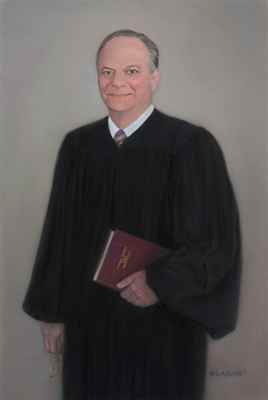 This portrait is in the Sidney M. Aronovitz United States Courthouse. Working with the family to create this portrait was a wonderful experience. If you are contemplating a portrait of this nature contact me directly so we can talk about your ideas with a consultation at no charge. Also for more information about commissioned portraits visit the details page. Since this site is based on personal attention call or email me about your ideas. L.A. CLINE, Master Pastel Artist. I was commissioned to create a pastel portrait of “The Honorable Judge Sidney M. Aronovitz” Memorial Corporate Painting by his family. The Honorable Sidney M. Aronovitz was a United States District Judge for the Southern District of Florida for over 20 years and was born in Key West, Florida, on June 20, 1920. He Graduated from Key West High School as Senior Class President and Valedictorian. After Graduating from the University of Florida with High Honors, he served as Captain in the United States Army in Europe from 1943 to 1946, earning the Bronze Star. Following his military service, Sidney Aronovitz practiced law in Miami Florida, for over 30 years. In 1976 President Gerald R. Ford appointed Aronovitz to the Federal Bench, where he served with distinction for the remainder of his life. The accomplishments of the Honorable Sidney M. Aronovitz were much more far-reaching and exciting than one paragraph can express. This man was such a Devoted Person, Devoted to his Country and his Family, his beloved Elinore and his two daughters Elaine and Karen and son Tod who worked with his Father before opening his own law firm in 1988, Aronovitz Law. Tod Aronovitz was also President of the Florida Bar, 2002-3. Aronovitz, Three Generations of Protecting Peoples Rights, read more!! In 1980 after the “Freedom Flotilla”, there were over 2000 Key West Vessels seized by the Federal Government. These vessels helped Cuban refugees get to the United States under President Jimmy Carters “Open Arms” policy. Judge Aronovitz ordered these vessels released and the cancellation of over 4.6 million in fines that were assessed against the boat owners. Judge Aronovitz was also selected by the United States Supreme Court Chief Justice William Rehnquist to serve on the original United States Foreign Intelligence Surveillance Court from 1988 to 1992. Judge Aronovitz bravely defended the United States Constitution by protecting the rights of the homeless, women, Cuban refugees and other minorities. Federal Judge Aronovitz was awarded the prestigious Gold Medallion Award by the National Council of Christians and Jews. The Council bestowed their highest honor to Federal Judge Aronovitz for his dedication to the administration of the rule of law without consideration of race, creed or national origin. Judge Aronovitz gave hours of pro bono legal work and served as a Founder, Incorporator and Member of the Original Board of Directors of the Cedars of Lebanon Hospital in Miami. The Honorable Sidney M. Aronovitz was inducted into the University of Florida College of Law Heritage of Leadership Recognition’s Society, and the Judge Sidney M. Aronovitz Memorial Scholarship was established in his honor to help minority students. These highlights were taken from Biography printed for the day of the Ceremonial Naming of his Courthouse. I have read his Biography many times and each time is like the first. It is a list of great accomplishments not only as an American who loved his country and his home town but also as the loving Husband, Father and Grand Father and Great Grand Father. He was married over 50 years! In October of 2009, President Barack Obama signed into a law a bill to rename the U.S. Post Office, Custom House and Courthouse in Key West the Sidney M. Aronovitz United States Courthouse. It was truly an honor for me to have the trust of his loving family to create the Portrait of Sidney M. Aronovitz which adorns the lobby. Join my mailing list for updates on my new art!